A dry ear is unlikely to become infected, so it is important to keep the ears free of moisture after swimming or bathing. 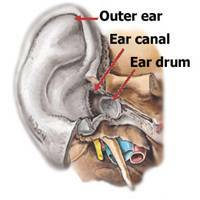 Removable earplugs, sometimes worn for hearing protection, can be used to keep moisture out of the ear canal. Q-tips should not be used for this purpose, because they may pack material deeper into the ear canal, remove protective earwax, and irritate the thin skin of the ear canal creating the perfect environment for infection. An itchy ear is a maddening symptom. Sometimes it is caused by a fungus or allergy, but more often it is a chronic dermatitis (skin inflammation) of the ear canal. One type is seborrheia dermatitis, a condition similar to dandruff in the scalp; the wax is dry, flaky, and abundant. Some patients with this problem will do well to decrease their intake of foods that aggravate it, such as greasy foods, carbohydrates (sugar and starches), and chocolate. Doctors often prescribe a cortisone eardrop at bedtime when the ears itch. There is no long-term cure, but it can be kept controlled.